In honouring so humble an object as this Finch with the name of BACHMAN, my aim is to testify the high regard in which I hold that learned and most estimable individual, to whose friendship I owe more than I can express on this occasion. "In the month of April, 1832," says my worthy friend, the gentleman just named, "I discovered near Parker's Ferry, on the Edisto river, in this State, a Fringilla which I had not seen before, and which, on investigation, I found had never been described. On searching for the same bird in the neighbourhood of Charleston, I discovered it breeding in small numbers on the Pine Barrens, about six miles north of this city, where I obtained many specimens of it. "This bird appears to be rarer in Carolina than it really is. It is in fact oftener heard than seen. When I first heard its notes, they so nearly resembled those of the Towee Bunting, that I took it to be that bird: a somewhat greater softness, and a slight variation in the notes, alone induced me to suspect that it was another, and caused me to go in pursuit of it. Since then I have heard as many as five or six in the course of a morning's ride, but found it almost impossible to get even a sight of the bird. This was owing, not to its being particularly wild, but to the habits it possesses of darting from the tall pine-trees, where it usually sits to warble out its melodious notes, and concealing itself in the tall broom-grass which is almost invariably found in those places which it frequents. As soon as alighted, it keeps running off in the grass, like a mouse, and it is extremely difficult to put them up, or see them afterwards. "It breeds in Carolina, to all appearance on the ground, where it is usually found when not singing. I never saw its nest; but in the month of June last (1833), I observed two pair of these birds, each having four young ones, that were pretty well fledged, and following their parents along the low scrub oaks of the pine lands. "This is decidedly the finest songster of the Sparrow Family with which I am acquainted. Its notes are very loud, considering the size of the bird, and can be heard at a considerable distance in the pine woods, where it is found, and where it is the only songster at that season. "In the beginning of November, this bird usually disappears, and I think it probably migrates farther south. Still it is likely that it does not go beyond the limits of the United States, and that some few remain in Carolina during the whole winter, as, on the 6th of February, the coldest time of the year, I found one of these birds in some long grass, a few miles from Charleston." Since then, kind reader, I have had the pleasure, in the company of its amiable discoverer, to hear the melodious notes of this southern species. Our endeavours, however, to find its nest have been unsuccessful. On my return from the Floridas to New York, in June 1832, I travelled through both the Carolinas, and observed many of these Finches on the sides of the roads cut through the pine woods of South Carolina. At this time, they filled the air with their melodies. I traced them as far as the boundary between that State and North Carolina, in which none were seen or heard. They were particularly abundant near the Great Santee river. The food of this species consists of the seeds of grasses, coleopterous insects, and a variety of the small berries so abundant in that part of the country. Its flight is swift and direct, now and then protracted, so that the bird is out of sight before it alights. I observed no difference in the size or colour of the sexes, and have represented a male in full summer dress, which was presented to me, while yet quite fresh, by my friend BACHMAN. Georgia and South Carolina. Rather rare. Migratory. BACHMAN'S FINCH, Fringilla Bachmanii, Aud. Orn. Biog., vol. ii. p. 366. Bill short, conical, acute; upper mandible almost straight in its dorsal outline, rounded on the sides; lower mandible slightly convex beneath, the sides rounded; edges of both sharp and inflected; gap-line deflected at the base. Nostrils basal, roundish, partially concealed by the feathers. Head rather large, neck short, body rather full. Feet of moderate length, slender; tarsus covered anteriorly with a few longish scutella; toes free, scutellate above, the lateral ones nearly equal, hind-toe proportionally large; claws slender, compressed, acute, slightly arched, that of the hind-toe longer. Plumage soft, blended, rather compact on the back, slightly glossed. Wings shortish, curved, third and fourth quills longest, fifth and second nearly equal; the secondaries long and rounded. Tail long, graduated, and deeply emarginate, of twelve straight, narrow feathers, tapering to a rounded point. Bill dark brown above, light blue beneath. Iris hazel. Feet very light flesh-coloured. The general colour of the upper parts is reddish-brown, the central parts of the feathers on the back black, their margins bluish-grey. Secondary coverts dull yellowish-brown on the outer edge; quills dark brown, the first seven or eight slightly edged with pale ochre, the rest edged with light brown, flexure of the wing bright yellow; small coverts varied with brown and yellowish-grey. Tall-feathers brown, lighter on the outer edges. A streak from the upper mandible over the eye, as well as the margin of the eye, ochre-yellow. Throat pale yellowish-grey, with a short streak of blackish on each side, from the base of the mandible; fore part of the breast and sides tinged with brown; the rest of the lower parts yellowish-grey. Length 6 inches, extent of wings 7 1/2; bill along the ridge 1/2, along the sides 5/8; tarsus 7/8. The Female is slightly smaller, but does not differ in colouring. PINCKNEYA PUBESCENS, Mich., Fl. Amer., vol. i. p. 105. Pursch, Fl. Amer. Sept., vol. i. p. 158.--PENTANDRIA MONOGYNIA, Linn. 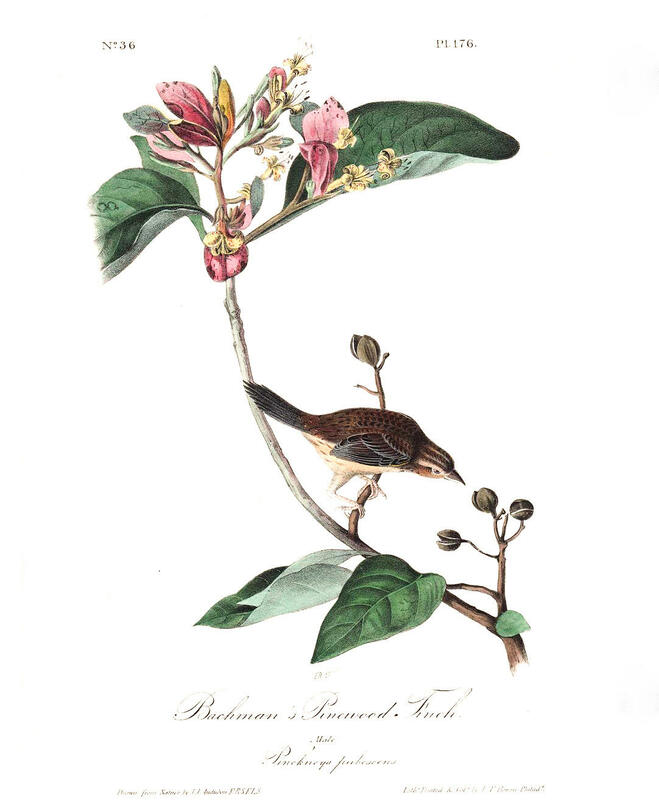 This shrubby tree grows on the banks of rivers, and near swamps, in Georgia; but the twig represented in the Plate was from a tree in the beautiful botanic garden of M. NOISETTE, a few miles from Charleston, in South Carolina. The leaves are oval, acute at both ends, somewhat downy beneath; the flowers are yellow, tinged with red; one of the divisions of the calyx enlarges to a whitish leaf, tinged with red, which renders the plant highly ornamental.